A self-confessed workaholic, Arthur Lowe enjoyed a long career as one of Britain's foremost character actors, in film, television and on the stage. The latter included Shakespeare , Ibsen , Osborne and large-scale musicals such as Pal Joey. But it is with comedy that he will forever be associated, largely through the pompous, but well-loved, character of Captain Mainwaring in the comedy series Dad's Army (BBC, 1968-77), a role he played on television for nine years. 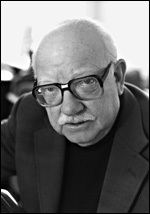 Jimmy Perry , the series' co-writer, declared Lowe one of the greatest comedy actors of our time. He became involved with theatrics during war service as a radar technician, helping to stage (and perform in) plays for the troops while in Palestine and Alexandria. Bitten by the acting bug, he took it up professionally following the war (joining a Manchester repertory company), making his stage debut in Terence Rattigan 's Flare Path in 1945. Aged thirty, short and prematurely bald, nature had already allotted him the role of character actor rather than romantic lead. Stage work, in regional rep and in London, occupied the greater part of his time in the 1950s. Television work, however, became increasingly frequent (albeit in small roles) as the decade wore on, following his debut in the three-part historical documentary series I Made News (BBC, 1951). Lowe 's numerous television appearances during the 1950s include To Live in Peace (BBC, tx 27/11/1951), in a small role as a friar; the six-part The Three Musketeers (BBC, 1954) as Bonacieux, landlord to Laurence Payne 's D'Artagnan; one episode each of The Children of the New Forest (BBC, 1955); and The Prince and the Pauper (BBC, 1955); the Play of the Week ' Disturbance ' (ITV, tx. 4/6/1958), a prison hostage drama in which he had progressed to being fourth in the cast; and, in his first major television break, one of the leads in the ocean liner-set soap All Aboard (ITV, 1959). It was his appearance as Leonard Swindley in another soap, Coronation Street (ITV, 1960- ), which was to bestow national fame upon Lowe . Making his first appearance in the third episode on 16 December 1960, he was initially contracted to appear in only three episodes; despite fears of typecasting, he stayed for five years. He made his final appearance on 31 May 1965. Such was his popularity as Swindley, however, that he continued with the character in two spin-off comedy series, Pardon the Expression (ITV, 1965-66), which began transmission only two days after his last Coronation Street appearance, and Turn out the Lights (ITV, 1967). He was actually third choice for the role of Captain Mainwaring in Dad's Army , but he quickly established himself in the role and it is now impossible to imagine anyone else playing the character. The fact that writers Jimmy Perry and David Croft began to incorporate some of Lowe 's own personal traits in the character partly accounts for this, but it is largely down to Lowe 's great skill. Whether in moments of tired exasperation as he listens to yet another crackpot idea from Corporal Jones, or in his chastising of Pike ("you stupid boy"), Lowe 's comic timing was peerless. In 1970, Lowe won the Variety Club 's BBC Television Personality of the Year award for his work in the series. Further comedy series were to follow, although none were to achieve the scale of success enjoyed by Dad's Army . These include Doctor at Large (ITV, 1971), The Last of the Baskets (ITV, 1971-72), Bless Me, Father (ITV, 1978-81), Potter (BBC, 1979-80), and A.J. Wentworth, BA (ITV, 1982). However, the diversity of his roles demonstrated that his range was wider than just outright comedy. More serious roles included the single television plays ' A Voyage Around my Father ' (BBC, tx. 16/10/1969) in Plays of Today , based on the John Mortimer story; ' Alfred Potter's Story ' (ITV, tx. 18/4/1973) in Armchair Theatre ; as Herbert Morrison in the spy drama ' Philby, Burgess & MacLean ' (ITV, tx. 31/5/1977) for ITV Playhouse ; and James Bridie 's ' Daphne Laureola ' (ITV, tx. 15/1/1978) in Laurence Olivier Presents , co-starring Lowe with Olivier and Joan Plowright . Drama series include his portrayal of Louis Pasteur in Microbes and Men (BBC, 1974), and his delightful interpretation of Mr. Micawber in David Copperfield (BBC, 1974-75), which arguably eclipsed the well-loved performance of W.C. Fields in the 1935 film version. Among Lowe 's admittedly sporadic work in cinema, the films he made for Lindsay Anderson are undoubtedly his best: This Sporting Life (1963), The White Bus (1967), If... (1968), O Lucky Man! (1973), for which he won a Bafta award as best supporting actor, and Britannia Hospital (1982). His superb performance as Tucker, the family retainer, in Peter Medak 's The Ruling Class (1971), was another noteworthy cinematic offering. Lowe had been in ill health for a number of years, suffering from narcolepsy. His last television appearance was as a guest on Pebble Mill at One (BBC tx. 14/4/82), publicising the play, Home at Seven, in which he was then appearing. Lowe collapsed from a stroke that night, dying in the early hours of the following morning.